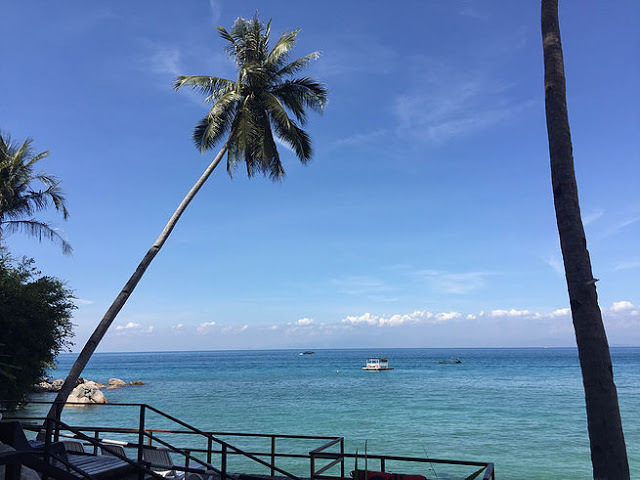 There are only a handful of hotels & resorts at Pulau Perhentian Kecil, and Alunan Resort is arguably the best resort on the island. It is a pretty small island and Alunan Resort is on the quiet side of the island. 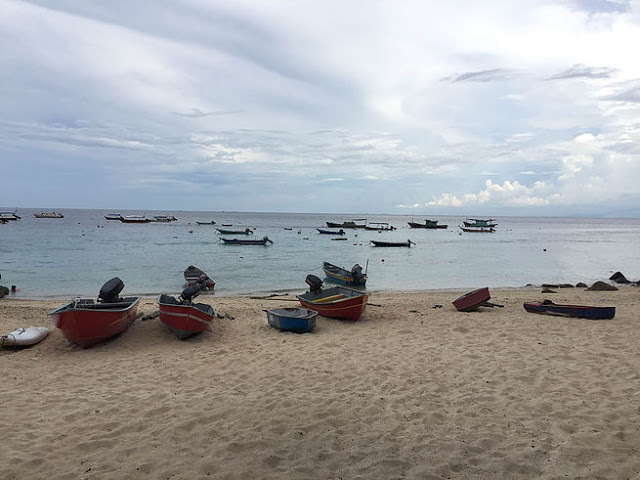 Getting to Pulau Perhentian Kecil involves some challenges for first timers. Get yourself to Kuala Besut jetty, park your car, ride a boat, and voila! You will find yourself on an unspoiled island surrounded by pristine beach. 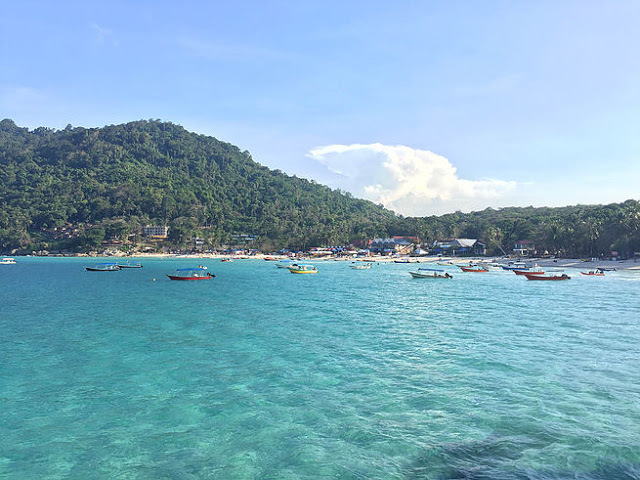 (Coming up on this blog: Tips & Tricks in Getting Yourself to Pulau Perhentian). The rooms (or rather the suites) are furnished with modern interior. There are only 18 suites on the premise (with the choice of twin sharing, triple sharing, quad sharing and family suite). Each suite comes with its own rooftop sundeck. As a bonus, there is a hammock on the rooftop where you can lay down with a good book and relax while accompanied by the sound of the waves. However, I find the artificial grass on the sundeck a little cliche. Basic toiletries and towels are provided in every room for your convenience. Bottled water are provided in the room as well, so you don't have to worry about the basic needs. However, don't leave your other necessities at home, such as sunscreen, facial wash, etc. There is no shop nearby that you can rely on (take note that this resort is located on the other side of the island. You need to take a boat ride to reach to the happening side). View from our room. 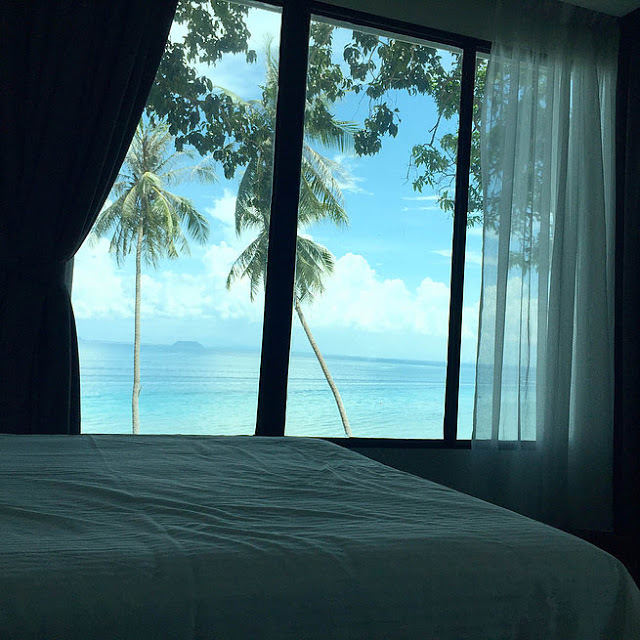 Imagine waking up to the scenery like this everyday! Very comfortable sundeck overlooking the sea. Although cut off from civilization, the resort is well-prepared with the needs of their guests. Upon arrival, you will find the open-concept lobby on the terrace. The lobby is equipped with unforgivingly slow wifi (reason to connect to the nature more), a collection of books left by guests from all around the world, and soothing music. I must confess, one of my worries involves access to food. 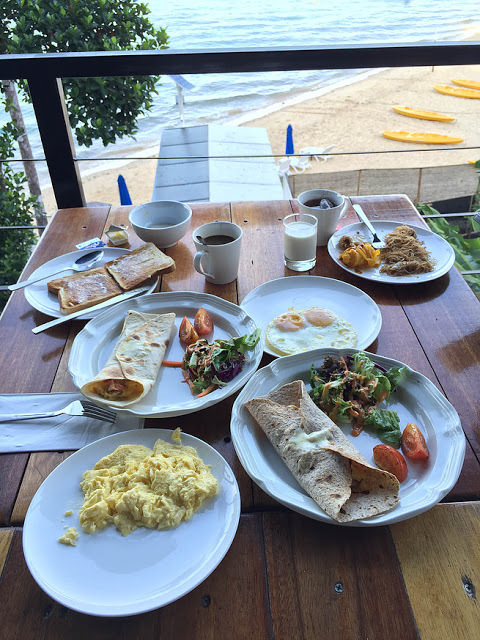 I called the resort a day before I arrived asking about it and they said the restaurant serves free breakfast. Ala carte lunch and dinner are available as well for a decent price. I was quite skeptical and I requested my girlfriends to pack me some instant noodles, lucky enough, we didn't have to cook our noodles. The food served at the restaurant was good beyond our expectation. 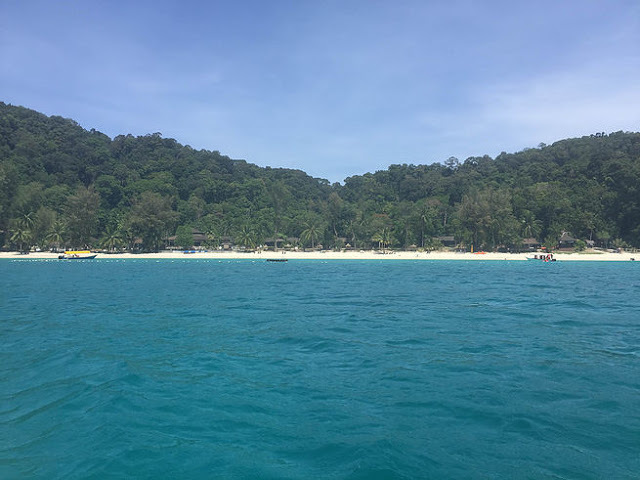 At noon, you can utilize the free water taxi provided by the resort to visit Pulau Perhentian Besar or get to the other side of the island where the happenings happened. Check with the receptionist on the departure time & availability. Kudos to the boatman (his name is Moon). He's a friendly chap and knowledgeable guide. On our trip, he took us on a round island and stop by other beaches nearby, and we even saw a turtle swimming in the sea! Water sports activities can be arranged at the reception when you arrive for a minimal fee. Some of the water sports are operated by the resort (snorkeling, kayaking, island hopping) and some are outsourced to the local operators (diving). To the left of the resort is a short trail to the local fisherman's village. 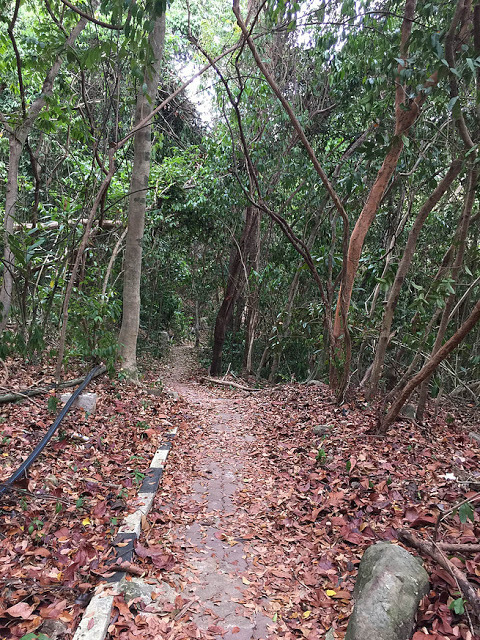 The half hour jungle tracking was easy to follow and requires no preparation. I do encourage you to visit the local village and experience the simple life of the natives. Getting to the other islands around the area is also pretty easy with the free water taxi provided by Alunan Resort. 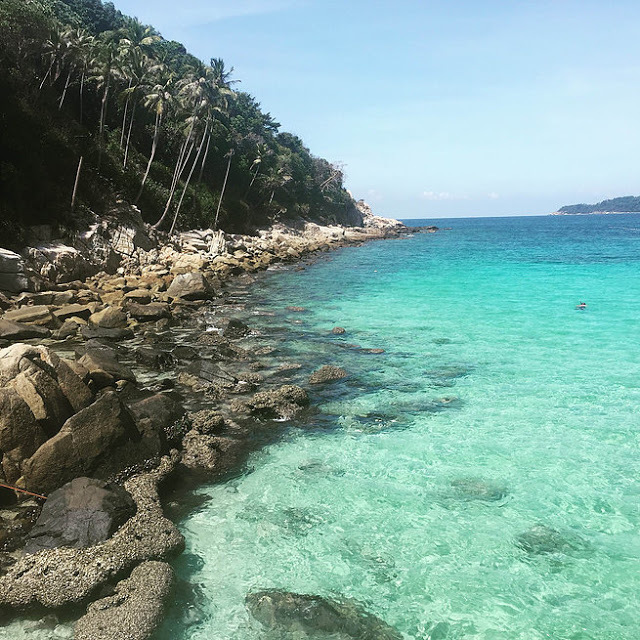 Pulau Perhentian Besar is only half hour ride away. You can spend an afternoon there. Alternatively, you can get to the other beaches of the island - the Long Beach, Romantic Beach, and Mira Beach. My favourite beach is Romantic Beach where there is literally no one but white sands and calm sea. 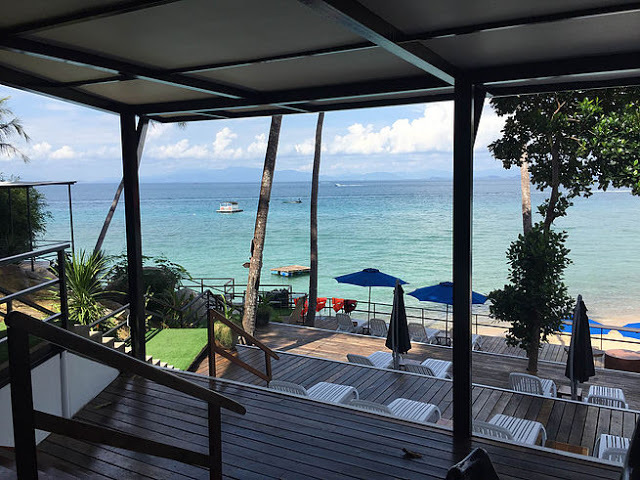 Although Alunan Resort owns a small stretch of private beach, the beach isn't the best on the island. The shore is hard to walk due to the accumulated dead corals and also hard rocks. To make up with the nature of the beach, the resort prepares water shoes. Also, the shore is inhibited by large amount of sea cucumbers which irked me a lot. Leave the sea cucumber alone and you will be fine. Snorkeling equipment is provided free of charge to hotel residents. The only bad experience I had was getting stranded at the drop-off station. The resort should provide a bell, a walkie-talkie, a phone or anything to allow guests to contact the resort from the sea. My friends and I got stranded pretty long on the platform and it doesn't help that there was no phone line there! They also didn't provide any notice there so when we first arrived, all of us were confused and asking ourselves... what the hell do we do now? The same problem occurs when we were waiting for the boat transfer when returning. The hotel should have helped us to call the boat service provider before we depart. Overall, I did enjoy my time at Alunan. I do forgive the bad experience because the other experiences were great and satisfying that make up to all the other bad ones. I think it is a perfect resort for a relaxing trip (or even a honeymoon!). Be reminded that the stairs can be pretty challenging for the elderly, children and others who need special attention. Pack light and prepare to walk up long flight of stairs. 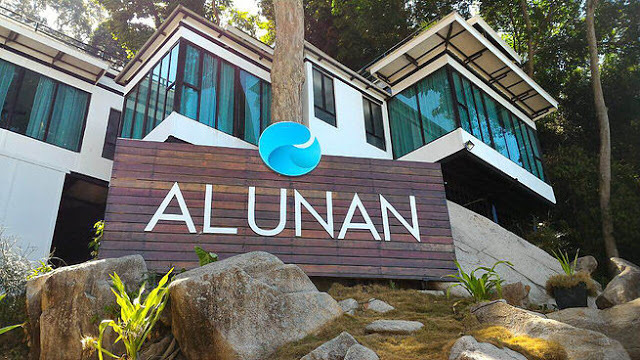 I do recommend you to go to Alunan Resort for a quick island getaway while they are still quiet and unspoiled. They are getting popular and the rooms sold out pretty fast. I'm afraid they might be commercialized sooner than expected. We paid approximately RM700 each person for 2 nights stay plus boat transfer.